I will be returning to Wizard World Portland in artists Alley. I've done two of their shows in Portland so I'm happy to be back for a 3rd time! I will post more details as they become available. I will be attending Wizard World Reno in artists Alley. I've done two of their shows in Portland so I'm very excited to be a part of one of their events in a new city! I will post more details as they become available. I will be appearing at the Artist's Alley at The Jet City Comic Show in Tacoma Washington! I will post more details as they become available. I will be appearing in Artist's Alley at Salt Lake Comic Con in Salt Lake City Utah! I will post more details as they become available. I will be displaying and selling my work in artists alley at Rose City Comic Con at the Oregon Convention Center in Portland, OR Sept 19-20! I will post more details as they become available. I will be attending Wizard World San Jose in artists Alley. I've done two of their shows in Portland so I'm very excited to be a part of one of their events in a new city! I will post more details as they become available. 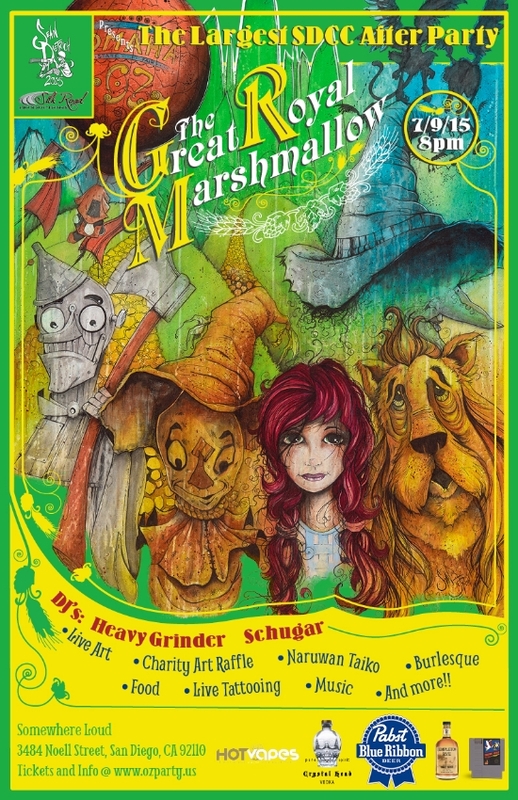 The Great Royal Marshmallow is an Oz themed San Diego Comic Con after party! I will be displaying and live painting at this huge event presented by Sean Dietrich and Silk Road Productions. They are pulling out all the stops on this one. Don't take my word for it, visit ozparty.us to see all the details!